Hacienda Margarita also known at one time as Hacienda Ballester, was established in 1874 by Spanish immigrants from Mallorca, brothers Damián, Cristóbal and Nicolás Magraner Morell. In 1894 records show that Margarita belonged solely to Damian Magraner Morell. In 1874 Hacienda Margarita consisted of 293 cuerdas and in 1884 of 500 acres which produced 120 quintals, making it one of the three larger coffee producers in Lares. By the end of the century Damian returned to Mallorca where he retired. Since ca. 1928 it belonged to Spanish immigrant from Sóller Juan Ballester Castañer (1879-1957) who grew it to 1,800 cuerdas by adding among others Hacienda Los Velez which remains today lie West of SR-4431. At this time it came to be known as Hacienda Ballester. After the death of Juan Ballester in 1957, it was inherited by his grandson Juan Colón Ballester who sold Margarita to Joaquin Oronoz and Emiliano Ruiz who in turn lost the property in 1964. On or about 1966 when it consisted of about 1,300 cuerdas, it was acquired by its current owner Francisco Levy. The remote location of Hacienda Margarita makes it unique. It is reached through a paved road that begins toward the North just west of the bridge over Quebrada Achiote at KM 6 of PR-431 and a 1¼ mile dirt trail some sections of which are quite steep. The dirt road is very narrow due to the dense forest which made it impossible for us to reach the facilities. In the valley near the river just at the end of the paved road and part of Hacienda Margarita, there was a small sugar plantation and a sugar mill. Of the mill, the only remain is an axle of the three mass crusher made by The Blymer Iron Works Co. in Cincinatti, OH pictured below. Part of the chimney and the Jamaican Train which were in existence in the 1990s are no longer there. 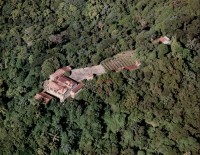 The old facilities are now owned by the Levy family who own the nearby Hacienda Rio Prieto. Efforts will be made to see if through the Levy family, access to the old facility can be gained. ​The color pictures below are made available and the courtesy of Archeologist Luis Pumarada O'Neill. The black and white pictures are part of a 1987 study by Dr. Pumarada, source: Puerto Rico State Historic Preservation Office.